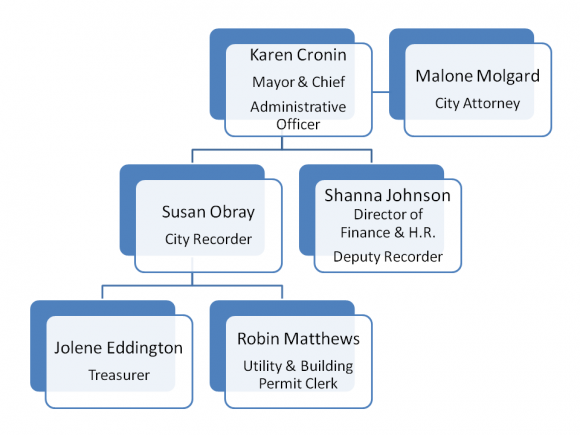 The City Recorder’s Office administers municipal legislative processes and is the central point for the public to obtain information regarding these processes. The Recorder’s office is responsible for preserving historical records of the city, recording and keeping documents and properly indexed records relative to the functions of the City. The Recorder serves as the City’s Election Officer and is responsible to coordinate and supervise municipal elections. The Recorder prepares agenda packets and coordinates the public hearings for City Council meetings, attends and maintains record of such meetings, handles all requests for records under GRAMA. The Recorder’s Office also handles processes related to subdivision recording and business & dog licensing. The Finance Division provides financial and administrative support for all internal and external customers. This is achieved by ensuring the timeliness of financial information, the adequacy of internal accounting, the budgetary controls, and the safekeeping of the City's assets. The Finance office is also responsible for preparing the annual City Budget and monitoring all revenues and expenditures. Human Resources (HR) is responsible for the attraction, selection, training, and retention of city employees. The HR Representative is also responsible for overseeing organizational culture, and ensuring compliance with employment and labor laws. The City Administrator serves as the Chief Administrative Officer of the City. He is responsible for the day-to-day administration of City operations and implementation of policies received from the Governing Body. He advises the Mayor and Council in policy formulation and supervises the City staff.